We produced this cap for the famous American Disney company, created in 1923 by Walt Disney. This is a collection that celebrates the famous heroes we all know. Today we present you the cap for the movie “Hercules”. A 6 panels snapback, entirely made in silkscreen and with a classic blue snapback closure. 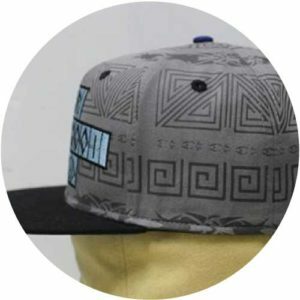 For the external appearance of this snapback cap 6 panels, as we told you previously, it consists of a gray screenprint with black patterns of ancient Greece. 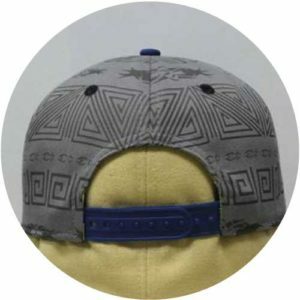 With a flat embroidery on the front. 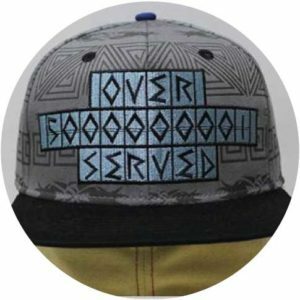 This embroidery is a quote from the film in a typography resembling the Greek alphabet. As for the interior, yellow printed tapping have been personalized with another quote written in red. 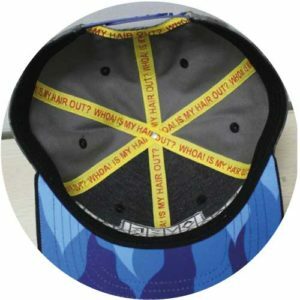 The screen print of the visor is related to the quote of the printed strips since it represents the hair of the villain of the movie ,“Ades” ,in blue flames. Disney Store is a subsidiary of the Walt Disney Company for the sale of Disney items in dedicated locations launched in 1987. The stores are part of the Disney Consumer Products division of the group. Visit their web site to explore their universe.